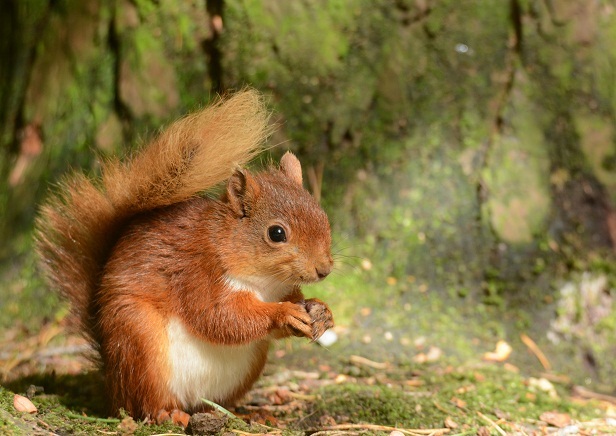 Families are invited to help track down one of our much-loved, but endangered animals, the red squirrel, at Silent Valley on Saturday 29 September, as part of Red Squirrel Week celebrations organised by Ulster Wildlife. Starting at 10am, join Shanna Rice, Ulster Wildlife’s Red Squirrel Officer for the Mournes, on a walk to explore the red squirrel’s woodland home – one of only a few remaining strongholds for the iconic nutkin in County Down. Look for clues left behind, such as nibbled pine cones and if you’re lucky, spotting the elusive creature itself. Then at 1.30pm, lend a helping hand building red squirrel feeders which will be used to provide additional food and keep a watchful eye on the red squirrels recently reintroduced to Silent Valley. Red squirrels have declined dramatically since the invasive non-native grey squirrel was introduced to Ireland in 1911. Ulster Wildlife, as part of Red Squirrels United, is working to protect this charismatic species through conservation and community engagement in four red squirrel strongholds in Northern Ireland, including the Mournes. Shanna said, “Silent Valley is now a great place to see red squirrels in the Mournes thanks to on-going partnership efforts to enhance the woodland in this area and to keep it free from the invasive non-native grey squirrel – the main reason for the reds decline. “Red squirrels born in Belfast Zoo were also released into Silent Valley earlier this year to boost the red squirrel population, so hopefully we will see some of these wonderful creatures on Saturday. To find out more or to book a place, please email shanna.rice@ulsterwildlife.org or telephone 07816 065764. Participants are advised to wear suitable clothing and footwear for walking on uneven ground.